Can I get a larger door than the existing garage door? You'll need to do some construction work in the garage. A larger door will need wider and higher opening. If you're okay with that, you can surely choose a larger door. 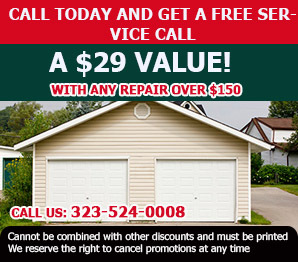 Our specialists in Montebello remind you to change some garage door parts, too. Why are garage doors important for the home's appeal? Garage doors are usually installed at the front part of the house and due to their huge size, they will either make a good or bad impression to visitors. When they are maintained properly and freshly painted, they will make your house look great. Should I get sliding or overhead doors? The choice depends primarily on the space in/out of the garage. Check the space at the side of the outer wall and measure the dimension of the ceiling. The results may answer your question because you might find that you don't have enough space in the ceiling for overhead doors according to our company in Montebello. What makes a good garage door? Apart from the standard considerations of price and availability, it is important to ensure that the garage door is functional. At the basic level, it must be able to keep intruders and the worst of the weather conditions out. Setting the security aside, the installation should also be aesthetically consistent with the property construction. One of my two springs is broken, do I really need two? Your garage door absolutely needs two springs for their efficient and safe use. They each support the weight of your door equally to keep it aligned. If one breaks, it means that the other will have to overcompensate, making the door difficult to open, dangerous to operate and bound to eventually break down.